About two weeks ago I had my first attempt at making tramp skis. Four 140cm broomsticks (2 for each foot) duct taped together, and then a vans slide duct taped on top of that. Obviously the slide would come off so I made a heel strap out of duct tape as well. Upon testing every broomstick cracked underfoot because the surface area was too high for the amount of pressure underfoot. Was able to jib a bit on this log thing before they really dislocated. Also able to Lincoln on the trampoline but I didn't get enough bounce to backflip. Not sure about how ill bind my feet in this time... Considering using a pair of military boots to increase the weight and keep my ankle from bending backwards a little more. Thoughts? Ever constructed your own skis before? The goal is more fun and versatility than accuracy to real skis. that sounds like a goodway to penetrate the tramp as well as yourself. 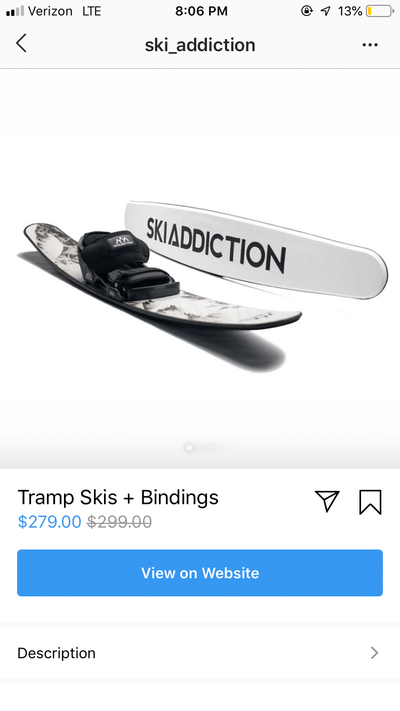 maybe its just me but tramp skis just seem kinda extra (for me at least, I understand their purpose). I just flip around the skate deck when flips n rotations get tiring to keep the heart rate up, its not skiing but some good coordination training never hurts... also its mad fun, honestly my dirty, old tramp was the best 50 bucks ever spent. THANKS Craigslist. KilaTsunami maybe its just me but tramp skis just seem kinda extra (for me at least, I understand their purpose). I just flip around the skate deck when flips n rotations get tiring to keep the heart rate up, its not skiing but some good coordination training never hurts... also its mad fun, honestly my dirty, old tramp was the best 50 bucks ever spent. THANKS Craigslist. For me the point is get an understanding of grabs while in the air, practice landing straight without the consequences, and generally develop style in the off season. Something to get a head start of the learning curve, if that makes sense. hubbards For me the point is get an understanding of grabs while in the air, practice landing straight without the consequences, and generally develop style in the off season. Something to get a head start of the learning curve, if that makes sense. Exactly! That's why I'm thinking this yard stick thing might work out for these purposes. Tramp skis don’t translate well at all compared to snow skiing imo. DIRTYBUBBLE Tramp skis don’t translate well at all compared to snow skiing imo. I won't. But if you do get them you should give a review on them. yeah but homemade ShitSkis don't sound very appealing anymore, Maybe when I was younger lol... Its because I'm very serious about using my trampoline to train and i'm hell-bent on mastering inverts. The problem is I only ride at Big Boulder and other East Coast hills, so we NEVER have nice soft pow to try dicey tricks on. I practice on the tramp ALOT when its warm, but without something on my feet, tricks just don't quite translate to the Mountain like I need. KilaTsunami yeah but homemade ShitSkis don't sound very appealing anymore, Maybe when I was younger lol... Its because I'm very serious about using my trampoline to train and i'm hell-bent on mastering inverts. The problem is I only ride at Big Boulder and other East Coast hills, so we NEVER have nice soft pow to try dicey tricks on. I practice on the tramp ALOT when its warm, but without something on my feet, tricks just don't quite translate to the Mountain like I need.